Creamy Garlic Four Cheese Pasta is filled with Asiago, Romano, Parmesan, and Cream Cheeses. 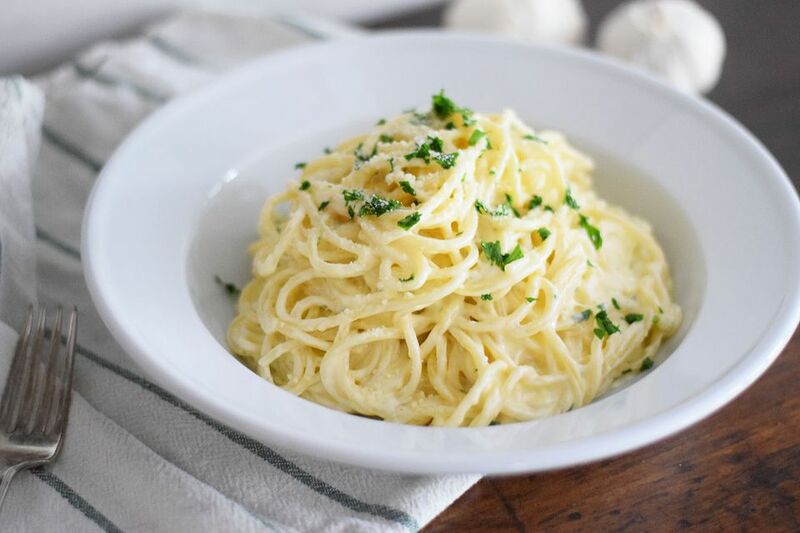 The Italian cheeses create a nice bite to the pasta while the cream cheese provides a creamy texture to the sauce. It's decadent yet super simple. It is a quick and easy pasta dish that can be made in less than 30 minutes. Add this dish to your weeknight repertoire. It only takes a few ingredients to whip this dish together and you can complete the entire dish in one pot if you wish. It is the perfect easy dinner recipe for any household. Serve this pasta as a meal by adding grilled chicken or shrimp or as a pasta course. I prefer using spaghetti in this dish, but you can substitute whatever kind of dry or fresh pasta you like. It would also be delicious with a fresh fettuccine. Cook the spaghetti according to the package directions for al dente pasta and reserve 1/4 cup of the pasta water after the spaghetti has finished cooking. Be careful not to overcook the pasta as it will finish cooking in the cheese sauce. Strain the spaghetti and rinse with warm water to prevent sticking while you prepare the sauce. Heat the butter and olive oil in a large skillet or in the same pot that you just used for the pasta. Reduce the heat to low and add the minced garlic and cook until fragrant. Be careful not to brown the garlic as it will change the flavor. While keeping the pan on low heat, stir in the heavy cream into the butter and olive oil. It may help to use a whisk. Then gradually whisk in the cream cheese, Romano, parmesan, and asiago cheese. Add the cooked spaghetti into the sauce and add the reserved pasta water. Toss until completely coated. Season with salt and pepper. Cook for another two minutes, stirring and tossing the pasta until some of the sauce has been absorbed into the pasta. Toss the pasta and sauce with the parsley and top additional parmesan cheese. Serve the pasta in warm bowls to keep the cheese sauce creamy while serving.